I almost sued Michael Mina once. More accurately, Michael Mina’s partners tried to hire me to sue him. My law firm wanted me to take the case, but I demurred because….well….simply because I liked his restaurant so much. The underpinnings of that suit had to do with the divorce that was then underway between the Bellagio and the Aqua Group — the company (and restaurant) that launched Mina’s career in San Francisco in the mid-1990s. By 1997, Aqua had become Frisco’s most famous seafood restaurant, and Steve Wynn (who had already lured Julian Serrano here from there), needed a seafood star to complete his murderer’s row of chefs at the Bellagio. 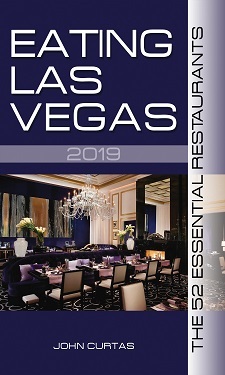 Aqua Las Vegas opened to great acclaim in 1998 (as did all of Bellagio’s stars), and for 7 years it was the unchallenged cooking champion of all things from the sea. As its eighth birthday approached, deals were coming to an end and leases needed re-negotiating. Mina apparently wasn’t in step with whatever his partners wanted, and that’s when both sides started lawyering up and I got the call. I don’t know anything else about the dispute except that within a matter of months, Aqua was out and Michael Mina (the chef and the restaurant) was in. Smartest move me and the Bellagio ever made. Aside from a drift away from the seafood that made him famous, not a lot has changed at Michael Mina over the years. It’s always been one of the prettiest restaurants in Vegas (you can thank designer Tony Chi for that) with lighting that flatters both the customers and the food. The one design flaw was the bar to the left as you enter. Originally designed as a sushi bar, it was small and awkward and not conducive to cocktails (or a pre-prandial glass of vino) — with the drinks (formerly) being handed down over a high ledge in front of the seats. As you can see above, this is no longer a problem. Neither is the menu re-vamp, which returns Michael Mina (the restaurant) to its roots. With this re-boot, the fish-friendly MM of yore is now alive and swimming in the Bellagio Conservatory. 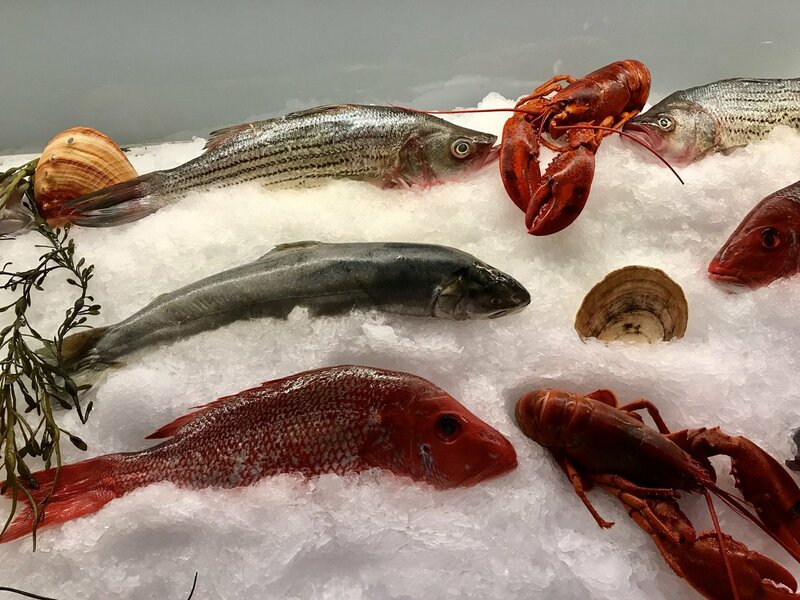 Taking a clue from Estiatorio Milos, a seafood display tempts as you are led past the bar, and if looking at whole branzino, John Dory, striped bass, Hawaiian kampachi and Arctic char doesn’t put you in the mood for a fish fry, nothing will. Mina made his name as a seafood chef. His early fame came from treating big hunks of pristine fish like land-locked proteins. He popularized pairing pinot noir wine sauce with salmon, and pairing tuna with foie gras. Even now, he and his crew see marine proteins as umami-rich sea meat, rather than delicate flowers to be barely trifled with. Where the Italians and Greeks barely dress their seafood with anything more than a squeeze of lemon, and the French nap theirs with the barest of butter, Mina looks at a fish as something to be assaulted (in a good way) with sauces. Thus does lobster come bathed in brandy and cream (in his ethereal pot pie), while fresh-off-the-boat John Dory gets a dressing of intense, fermented black beans and bok choy. In keeping with the times, things have lightened up a bit — the only French sauce offered is the mustard beurre blanc with the phyllow-crusted sole, but he can’t resisted coating a strongly-smoked trout with a river of Meyer lemon-caviar cream, His chefs will grill one those whole fish (or a half for 1-2 diners) and adorn it with grilled peppers and preserved oranges, or accent it with Thai green-coconut curry after deep-frying it Asian-style. Rule #1: If John Dory (aka San Pierre, aka San Pietro) is on the menu, get it. The John Dory is an exquisite fish – thick and meaty, but also delicate, not-too fatty and finely-grained. There is a firmness to the meat which will stand up to all sorts of preparations, but a soft sweetness to it that demands a careful hand. It goes well with a variety of sauces, and will stand up to strong accents — like the scallions, Serrano peppers and fermented black bean treatment it gets here. When properly cooked, it takes a rightful place in my pantheon of perfect pisces, along with wild turbot, fresh-caught Pomapno, and true Dover sole. Rule #2 is: Only eat fish in a fish restaurant. Rule #3: In a fish restaurant as good as this one, either close your eyes, point and pick, or ask the knowledgeable staff about the variations in species and how they are complimented by the cooking styles. That last one is crucial, because on any given night, 6-8 whole fish are laid out before you, each begging to be grilled/smoked over applewood, broiled and beaned, or deep-fried with coconut-green curry. 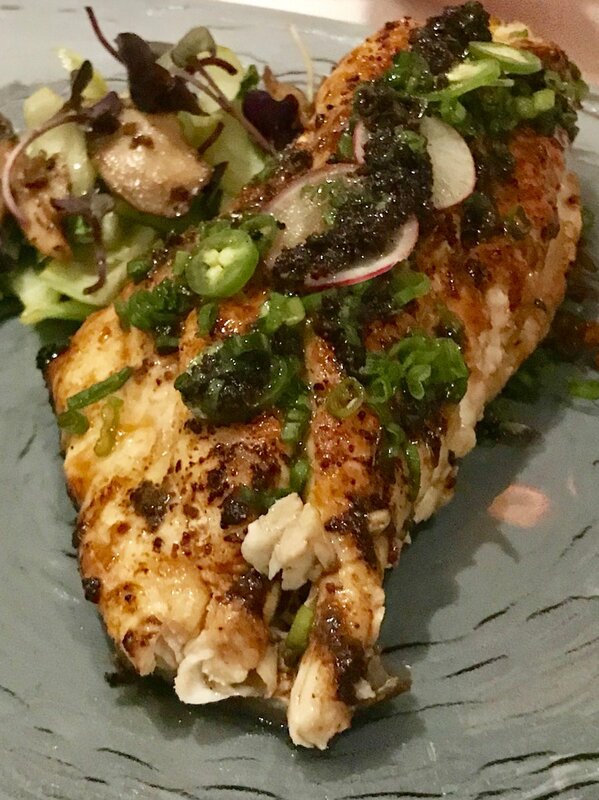 The lighter-fleshed fish (snapper, sea and striped bass) do well with this spicy coating and sauce, while the denser Dory, kampachi and char demand to be basically broiled. The only problem with the new menu is there are too many great choices. Sharpe and g.m. 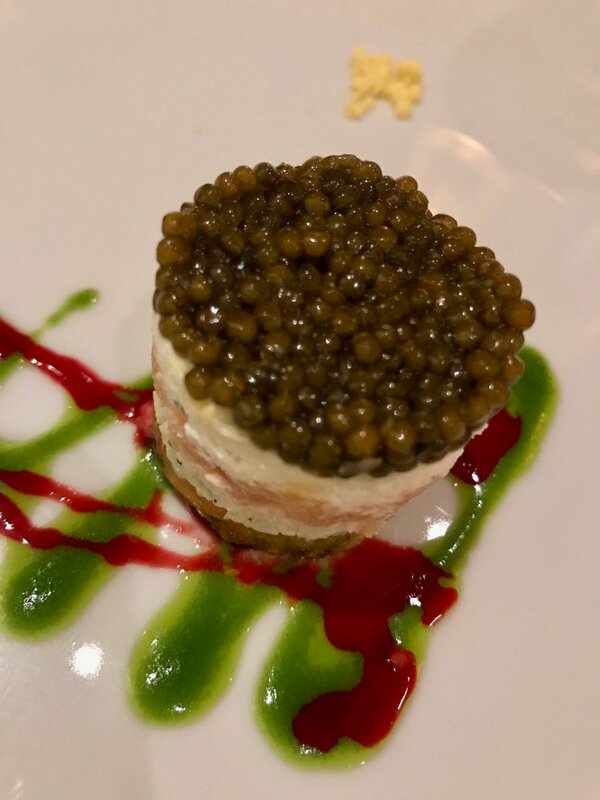 Jorge Pagani (who’s been with the operation for 17 years) suggest toggling back and forth between the Mina classics (caviar parfait, tuna tartare, hamachi crudo), with these new (“Market Light”) items to build your best meal, and that sounded like a sound plan to me. Mina has always known fatty liver like a Korean knows cabbage, and three forkfuls will prove it to you. 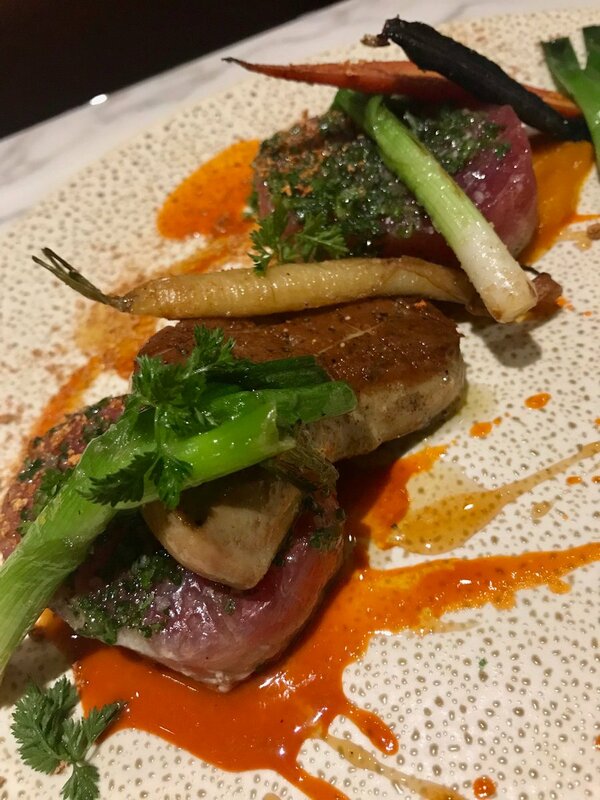 Take a bite of the tuna, then take a bite of the foie, then take a bite of them both together. No meat-meets-fish dish ever became greater than the sum of its two (magnificent) parts than this beauty. It’s expensive ($57), but it’s more than enough for two and almost a complete meal in itself for one. If you have room after all that seafood-y goodness, don’t miss the classic chocolate bar with salted caramel mousse, or the Egyptian rice pudding (almost as good as Greek! 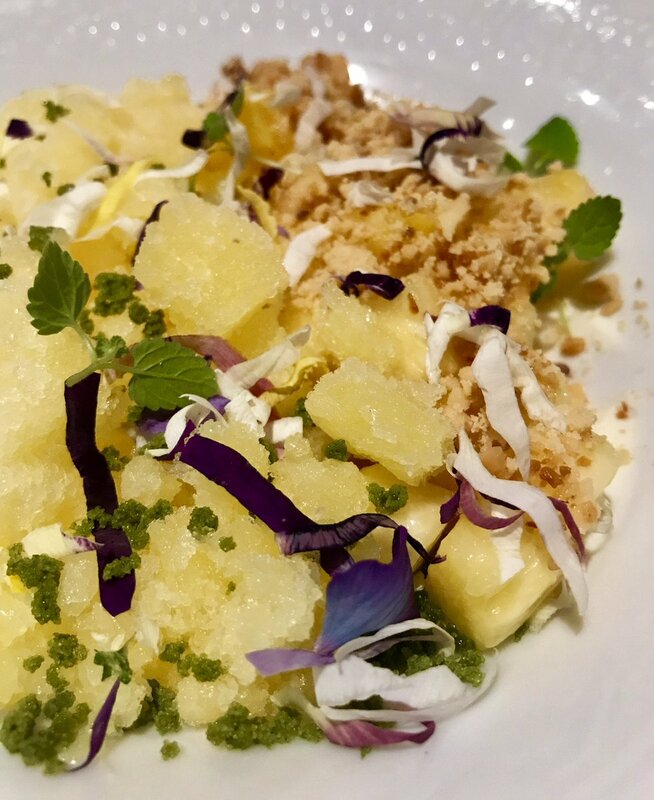 ), or the pineapple granita with vanilla panna cotta and Sicilian pistachios (below). Desserts here have been wonderful for as long as I can remember (which is all the way back to 1998), and as with the fish, whatever you point to will be worth it. A word about wine. 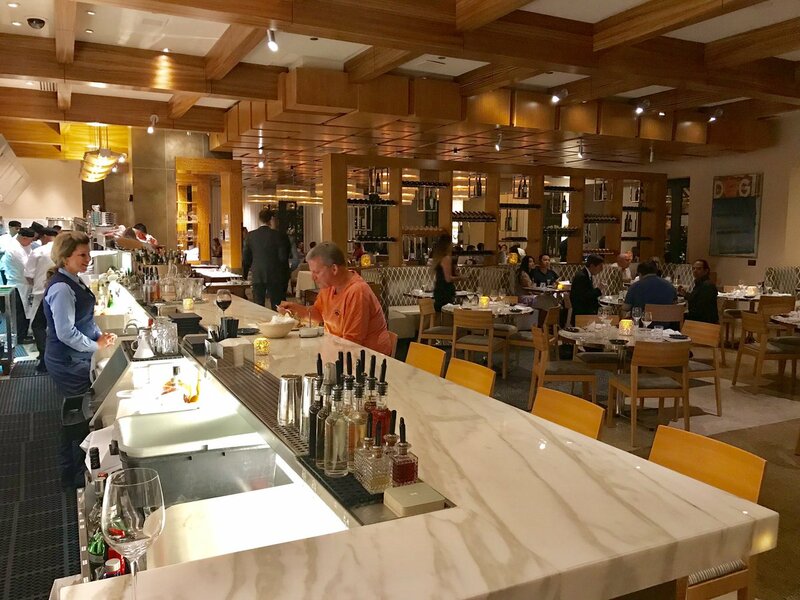 No one goes to the Bellagio looking for wine bargains, but this list is well-chosen with lots of white wines at (for the Strip at least) reasonable prices that match well with the food. My sweet spot when looking at Strip wine lists is the $60-$120 range, and if you root around, you’ll find a few German Rieslings that fit the bill — like Müller-Catoir Kabinett for $80. The bright acidity of drier German whites compliments Mina’s love of bold, rich flavors, as do the more mineral-rich Chablis and less-complex (read: cheaper) white Burgundies — which you’ll find more than a few bottles of that don’t break the bank. Anyone who orders a Cali cab with this food ought to be taken out and shot (figuratively speaking). The half-fish here run around $60-$75, which is a (relative) bargain. Most of the whole fish (that easily feed four) are double that. If you split some appetizers and go this route, you can get out of here for around $100/pp. Tasting menus are $138 and $188, respectively, and are more than worth it if you’re the “go big or go home” type. The last time I paid for a meal at MM, Bill Clinton was president. Edo Tapas & Wine is half as big as Pamplona with twice the ambition. Its matchbox size belies an attempt to expand the flavors of Spain beyond all boundaries. By and large it succeeds, in a forty seat space that announces from the get-go you’re in for a wild ride in tapas territory. It may look unassuming from the front but it has quite a pedigree. 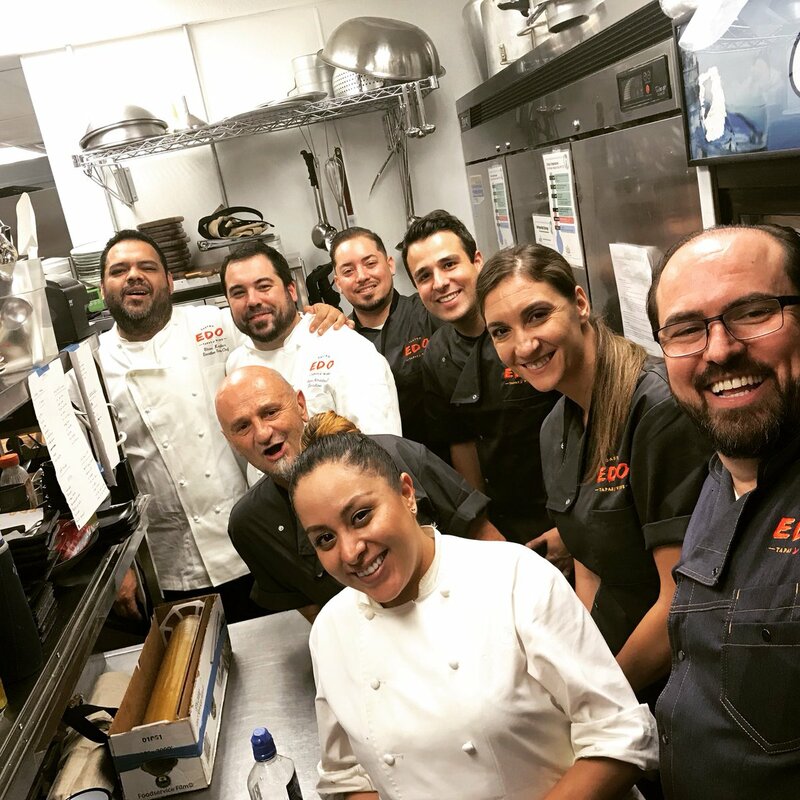 Exec Chef Oscar Edo is a Strip veteran (and a survivor of the food truck craze of 8 years ago), while partner Roberto Liendo (late of Bazaar Meat) runs the front of the house. Between them, they have a strong sense of the food and service a place like this needs to appeal to gastronauts who demands the new over the tried and true. 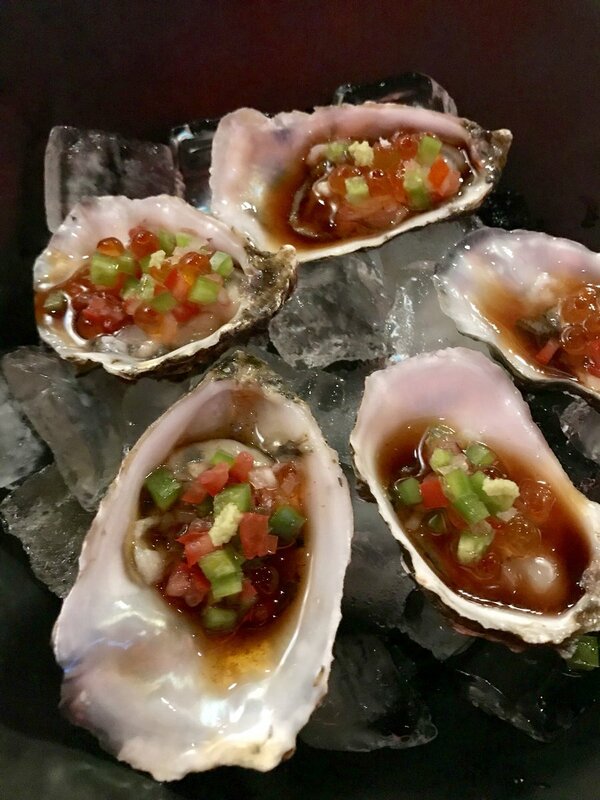 And while the whole small plates/tapas thing may seem like old hat by now, they freshen the genre by blending the traditional with more than just a wink and a nod to their Asian surroundings. The small, narrow space gets a big lift from a bright mural taking up an entire wall (above). The reference to Spain is dramatic, and sets the stage for a production that punches way above its weight. It presents the requisite specialty cocktails, along with a rolling gin and tonic cart, a small-but-mighty wine list (with nothing over a hundy), and those three sherries by the glass I was complaining about Pamplona not having. There’s also eight nice craft beers on hand, a variety of vermut (vermouths) and cordials, and dessert wines (all by the glass or bottle). If you think that’s a lot going on in this teeny space (formerly home to Chada Thai), then wait until you see the menu. Four different dressed oysters are offered — depending upon what sort of bath you like your bivalves to take. Personally, I went nuts over the tamarind mole with pickled cucumber (above), although you might prefer yours to be swimming in kiwi leche de tigre or braised melon, lemon and mint. Bottom line: they’re all fabulous. The obligatory Spanish cheese and ham selections, and they’re perfectly fine, if totally in line with what you’ll find all over town. (This is not to damn Spanish jamon with faint praise — it is the tastiest cured pork leg in the world — but only to point out that these folks get their stuff from the same distributors as everyone else, so if you’ve chowed down on one lomo, you’ve probably tasted them all. The really expensive hams are too muy caro for our ‘burbs, and you’ll have to head to Bazaar Meat (and pay through the snout) for them. As satisfying as these starters are, it is in the cold and hot tapas where Edo hits his stride. 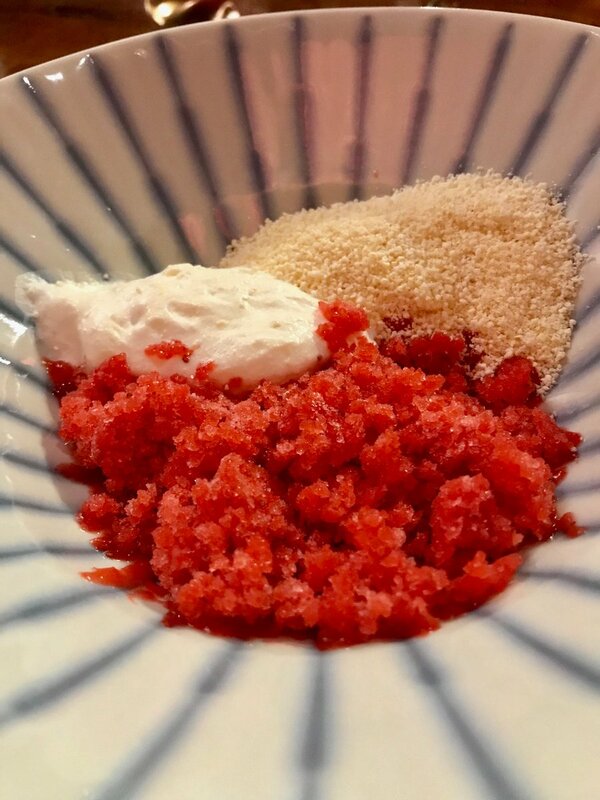 His fermented tomatoes with burrata and basil air was probably the most summery summer dish I had this summer; it both sparkled and soothed the palate the way only super-sweet tomates can — making like an overripe Caprese at half the weight. While his tuna tostada was a little bland for these buds, nice big and chunky Maine lobster comes “salpicón-style — dressed with more of that “tiger’s milk” — which nicely lightens the richness of the crustacean. One is tempted to wax poetic about these bikinis, so packed with flavor are these two inch envelopes. So much soft crunch, so much sausage punch, my guess you’ll want to order a bunch is more than a hunch. I overplay calling certain foodstuffs “addictive” at times, but the moniker fits here like the best cheese between bread you’ve ever eaten. 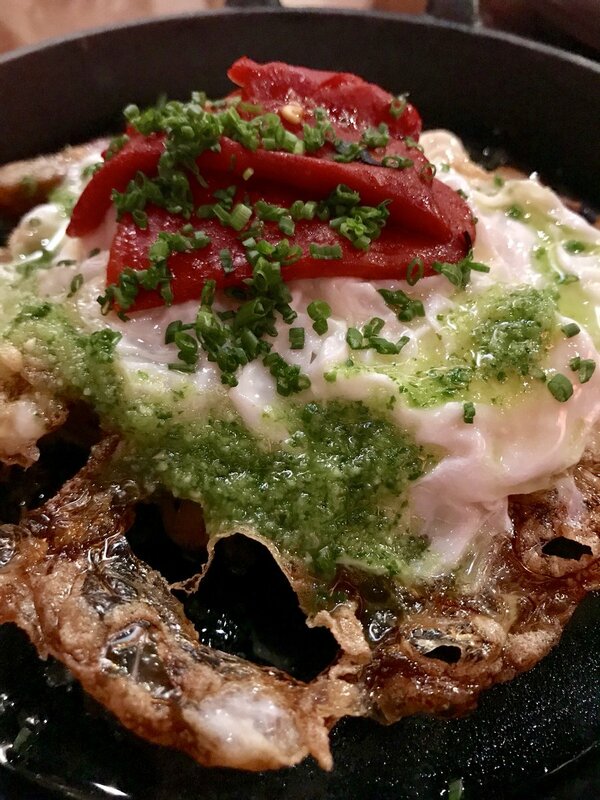 …a toothsome concoction of olive-oil fried eggs, piquillo peppers sitting atop a melange of mushrooms and fried potatoes. You can’t see the ‘shrooms underneath, but that collection of maitake, shitake, enoki, and king-oysters is crave-able in its own right. Top it all off with some garlic-parsley oil and you have a classic of Spain tweaked in all the right ways. Of course, some purists might disagree. My friend Gerry Dawes — who probably knows as much about Spanish food and wine as any American — went apoplectic (on Facebook over it not being a proper estrellados, but he misses the point. Edo is using this menu to riff on the cuisine of Spain. There will be hits and misses with some of his creations, but he’s putting it out there, and when the results are this lip-smacking, what’s to argue about? And when it comes to a certain famous Spanish rice dish, let’s just say that we are now blessed with a plethora of palate pleasing paella. 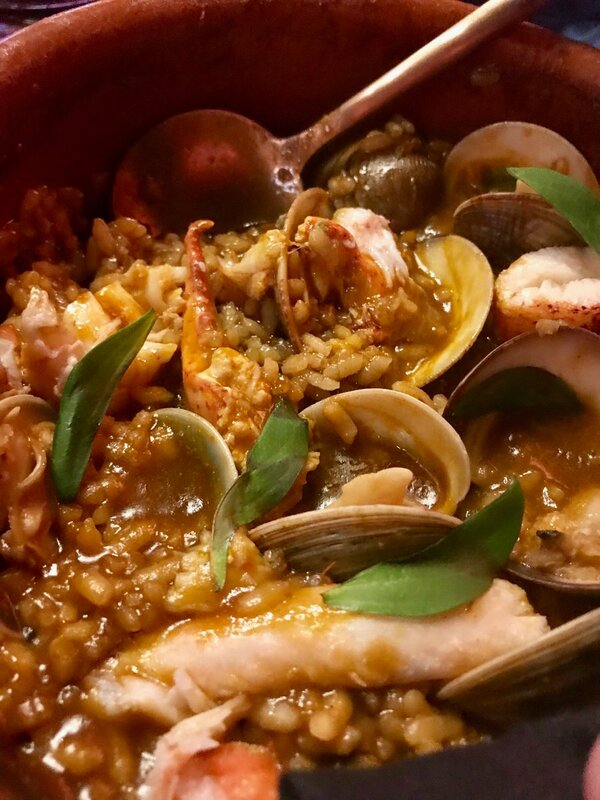 If I had to grade the different ones in town, I’d put both Edo’s and Pamplona’s a notch below Jaleo’s, if only because there’s no substitute for the open fire smokiness imparted by José Andrés’ paella pit. 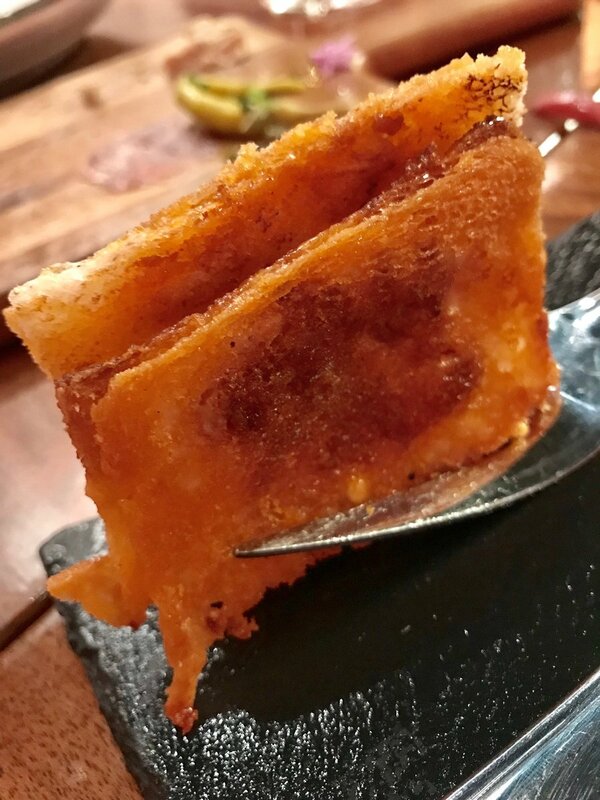 ….and if you’re looking for the most interesting Spanish food ever to come to off-Strip Las Vegas, you’ve come to the right place.